This easy-to-use, take-it-anywhere anchor affixes to any solid door and wont damage paint or wood. 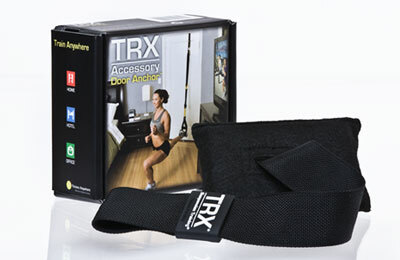 Now you can get your full TRX workout anywhere theres a door. The Door Anchors nylon, high-density foam, and felt system slips easily over the top of any solid wood or metal door and, when the door is shut, offers 100% sturdy support. It wont scratch or damage paint or wood, and it folds up for easy storage and portability. safety placard included; just hang it on the outside of the door.